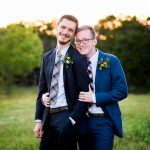 I had a blast getting to know this sweet couple during their Austin engagement session, and have been looking forward to their Cirkcet Hill Ranch wedding day ever since. Lindsey & Adam tied the knot at the gorgeous new Dripping Springs wedding venue Cricket Hill Ranch, with the assistance of wedding coordination gurus Pearl Events. This laid back couple wanted their guests to enjoy a beautiful outdoor Texas fall day under the oak trees, string lights, and party barn. Lindsey’s stunning lace Liancarlo dress was accompanied with the perfect rach shoes – brand new white Lucchese cowgirl boots! The bride’s boss acted as the couple’s officiant, and Adam held back tears as he saw Lindsey walking down the aisle with her dad for the first time. 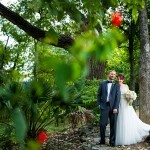 Two beautiful oak trees acted as the backdrop for their sweet vows, before an upbeat cocktail hour with Austin music legend W.C. Clark began. The guests dined al fresco to a delightful family style dinner by Royal Fig, with lush floral table garlands by Verbena and stylish vintage tabletop rentals by Loot Vintage Rentals. Greenbelt DJ got everyone on the dance floor for a wild dance party after dinner, complete with silly hats from Mexico for the dance floor antics. To wind down the night, guests fired giant funfetti cannons during the couple’s last dance, which was magical to say the least. Then the couple enjoyed a private last dance in the barn before their sparkler exit right out to their Austin Classic Limo getaway car! To sign up for notification when the photos are online and to order prints, CLICK HERE. Rhea McCarter - Thank you!!! LOVE!!!!!! coryryan - Lindsey looked absolutely flawless! Kudos to Adore Make-up!